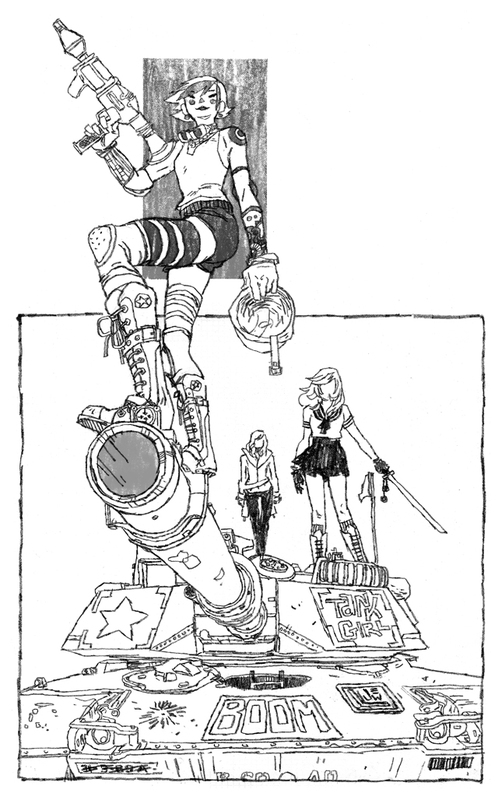 I loved Ashley Wood's covers on Tank Girl: The Gifting. They seeped into this drawing without my conscious effort or consent. The schoolgirl is from a weird, mostly upsetting seinen manga by a gentleman named Matsumoto. NOT TAIYO. A different Matsumoto. Anyway, she lives in a tank. In a park. My wife's up there, too. You can't tell it's her, 'cause it's super-tiny I haven't colored it, but she's there. With guns. She was actually the wardrobe consultant for this particular doodle. She does NOT live in a tank. A bigger, color version is pending-- I wanted to make sure I had something up for Friday morning, and my wardrobe consultant is making me go to bed. Thank you so much Jake for your comment.Well, I blocked my blog for awhile cause I could not update it, so I just say good bye to you dear Artist. Does she live in the park?